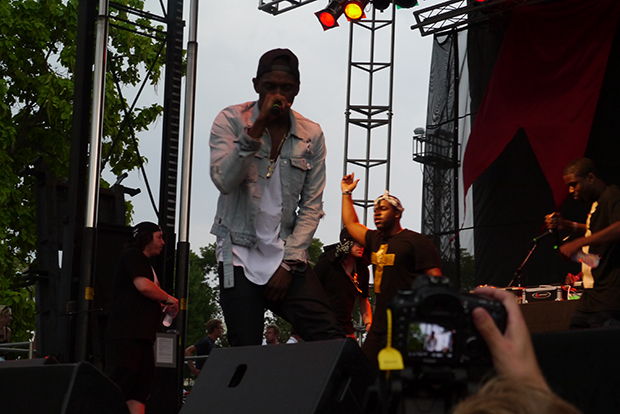 Pitchfork Day 1: A$AP Rocky and Big K.R.I.T. In a sharp programming shift, Day 1 went from the psychedelic pop of Olivia Tremor Control into the mixtape hip-hop of A$AP Rocky. The only similarity I can think of between the two acts is that there are higher than average odds that both their listeners partake of illicit substances. Walking into the photo pit at the start of Rocky&apos;s set, the presence of pot smoke went from occassional to all-encompasing. Photographers were even smoking joints while jockeying for position in front of the stage- the only time I&apos;ve ever seen that. The crowd quickly doubled in size, but quadrupled in excitement. Women in elaborate bathing suits suddenly appeared among the fans. Kids in front knew every word of every song. All this for a rapper who still hasn&apos;t released a proper album (but did recently sign a $3 million deal with RCA). As an outside observer to the hip-hop mixtape world, this set reminded me of Odd Future&apos;s performance at Pitchfork 2011. There weren&apos;t (as many) troubling anti-social, nihilistic messages in the music, but there was a shared language and lots of inside jokes that people learned in very specific corners of the internet. Thanks to a guest appearance by Chicago&apos;s LEP Bogus Boys the stage was crowded and chaotic at times. Oh, and there was lots of jumping into the crowd from the stage. There&apos;s no denying that Rocky is a born showman and midway through the set we got to see some of his talents come through. His crew took a break leaving Rocky almost alone on stage with Clams Casino&apos;s innovative production getting a chance to breathe. 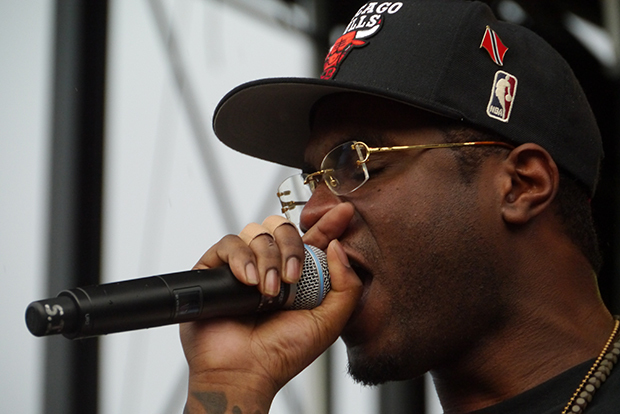 If he&apos;s able to approach shows less like a party and more like a performance, he may well grow into his namesake- his mother named him after hip-hop legend Rakim. Big K.R.I.T. 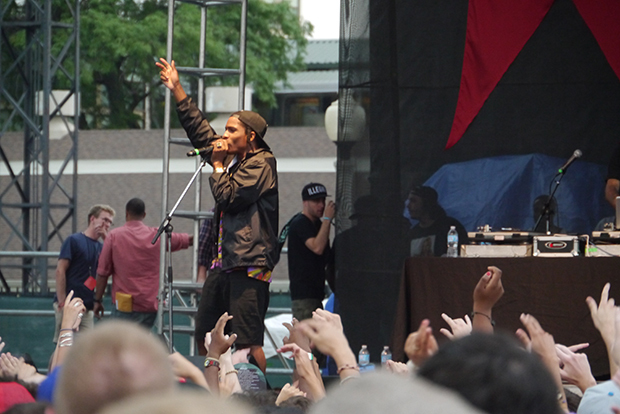 followed A$AP Rocky in what some festivalgoers called the "rap interlude" of Day 1. However, there was a world of difference in their performances. Big K.R.I.T. seemed much more than three years older than A$AP Rocky. 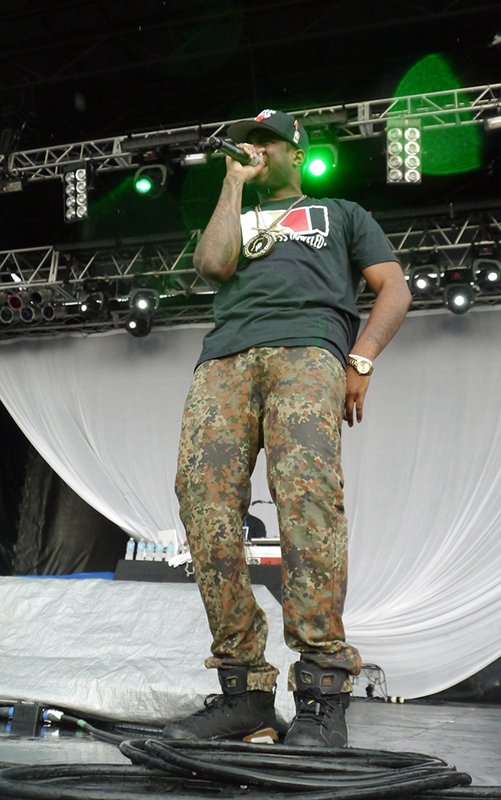 Prowling the stage in camoflagued pants, a Chicago Bulls hat and a necklace of his home state of Mississippi, K.R.I.T. was a singular performer, not the host of a party. Instead of Odd Future, I was reminded of Public Enemy and Outkast. His delivery was sharp and full of conviction- he meant what he said and didn&apos;t care much if your hands were in the air or not. And best of all, I didn&apos;t need to figure out what it means to be "trill."